If the idea of gift-wrapping presents makes your stress level skyrocket higher than the star on your Christmas tree, here’s a holiday hack that might be able to help. In a video uploaded to YouTube on Tuesday, an employee at the Takashimaya Department Store in Japan shows how to wrap a rectangular gift in under 15 seconds with one sheet of paper and only two strips of tape. The video features an employee fold, flip and turn presents and paper to get two presents wrapped in only 28 seconds. With this technique, you just might be able to whip through your holiday gift-wrapping without needing a hit of eggnog. This entry was posted in Miscellaneous, Ocassion and tagged gift wrapping, gift wrapping in 15 seconds on December 18, 2014 by Yami. This entry was posted in Inspirational, Personal on December 3, 2014 by Yami. Last year typhoon Yolanda caused catastrophic destruction in the Philippines, particularly in the Samar and Leyte regions. Yolanda is considered the deadliest typhoon to hit the country in years. More than 6,000 people perished and thousand(s) more are still missing. Let us offer a minute of prayer to remember those who have died and to the families left behind. 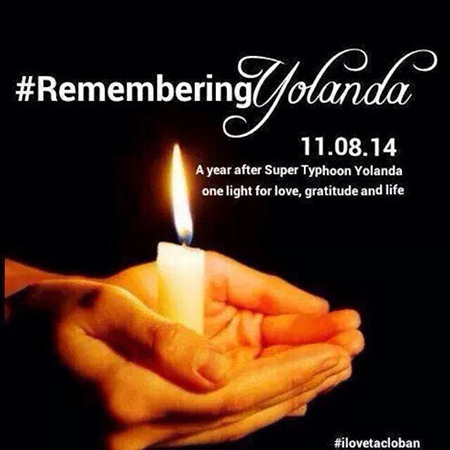 This entry was posted in Prayer, Reflection and tagged one year after yolanda, prayer for victims of yolanda, yolanda survivors on November 7, 2014 by Yami.